Phenomenal wide Marina views from every vantage point, ranging from directly in front of the lanai and soaring both East and West! 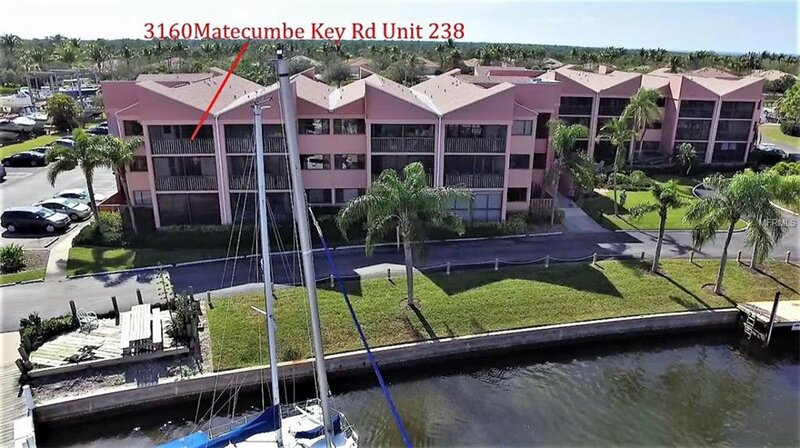 This beautifully decorated third-floor condo is being offered turnkey furnished and ready for a new owner to walk in and enjoy SW Florida's beautiful weather or use as an investment property. Comfortable 139 Sq. Ft. tastefully tiled and screened Lanai allows for much entertainment as you watch all the marina activity. The inside of the condo boasts of tile throughout, new sleeper sofa, new A/C unit, and laminate wood flooring in the Master bedroom. Located in Beautiful Burnt Store Marina & Country Club. Residents enjoy all the fabulous amenities of resort style living, 525-slip Marina with direct access to Charlotte Harbor and the Gulf of Mexico, Waterfront dining, 27 holes of challenging golf, athletic center, biking & walking paths, Platinum Point Yacht Club and more. Come to see for yourself why so many have chosen Burnt Store Marina & Country Club. Listing courtesy of CENTURY 21 SUNBELT BURNT STORE. Selling Office: CENTURY 21 SUNBELT BURNT STORE.